Land hermit crabs require specific environmental conditions to remain healthy and happy. One of the most important of these conditions is proper humidity. 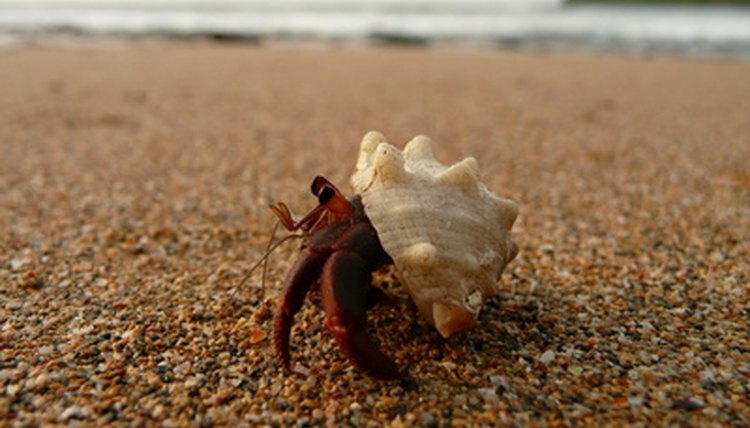 Hermit crabs breathe through modified gills, which require moist air to function properly; if the humidity inside their enclosure becomes too dry, hermit crabs can suffocate. One of the most effective ways of maintaining the proper humidity is through daily misting of your hermit crab tank. Fill a misting bottle with lukewarm distilled water, testing it before use to make sure that the water is neither hot nor cold. Check the humidity levels inside your hermit crab enclosure. A hygrometer placed inside the tank will provide this information. Humidity should optimally be between 75 and 85 percent. Mist the inside air of the enclosure with the misting bottle, avoiding direct contact with your hermit crabs. Check the humidity of the enclosure once again to ensure that the level falls between 75 and 85 percent. Mist the enclosure again if the humidity remains too low.  Check the humidity of your hermit crab enclosure several times a day, and mist at least once per day.